This is the second in a series of what I am affectionately calling "Always the (fill in the blank here), Never the Bride" by Sandra D. Bricker. This time around we meet Sherilyn Caine who has just landed the perfect fiance and the dream job of a lifetime. Ms. Bricker is learning to mix an eclectic set of characters and weave in an interesting scenario to capture the reader's and make them want to read more and more. Take a newly happy couple, a set of sisters, and a beautiful inn, add one new wedding planner, three wedding dresses, a resigned future bride-to-be with an over-bearing and controlling mother-in-law, and a quirky yet lovable dog that nobody wants. 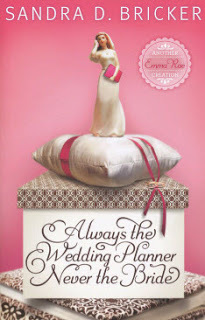 Mix in an Actor who needs a wee bit of help with the bottle and you get Always the Wedding Planner, Never the Bride. Ms. Bricker has done a marvelous job adding some very funny moments in the story, while keeping others quite poignant. Again, remember this is a Christian-based romance, so you won't see a lot of the traditional intimate "couple scenes", but you do get a wonderful flavor for what it is like to be a wedding by the added extras after each chapter. I really enjoyed this part most of all. Makes the book seem more realistic and for those reading it who really are planning their weddings, there are some wonderful tips to follow.